iVend POS powers brick-and-mortar stores as a full service, Point of Sale, designed for fast checkouts and exceptional customer interactions. iVend POS is priced per POS device (terminal or mobile), not per user. Each device can be configured to be operated by unlimited users enabling a true multi-user platform. With iVend POS, you only pay for the software per device, regardless of the number of cashiers and employees. iVend POS is Windows OS based software that allows for a variety of peripherals and device configurations, including scanners, cash drawers, displays and EMV-compliant card readers. iVend Retail currently runs on Microsoft using the Microsoft SQL Server database. iVend POS can be deployed on-premise or on-Cloud. Stores can have a store server and the POS devices can be linked either to the store server or directly to iVend Enterprise over the Internet. Whatever the configuration chosen, full resilience is maintained even if network connections are lost for a period of time. The replication engine ensures referential integrity is maintained when the network connection is restored. 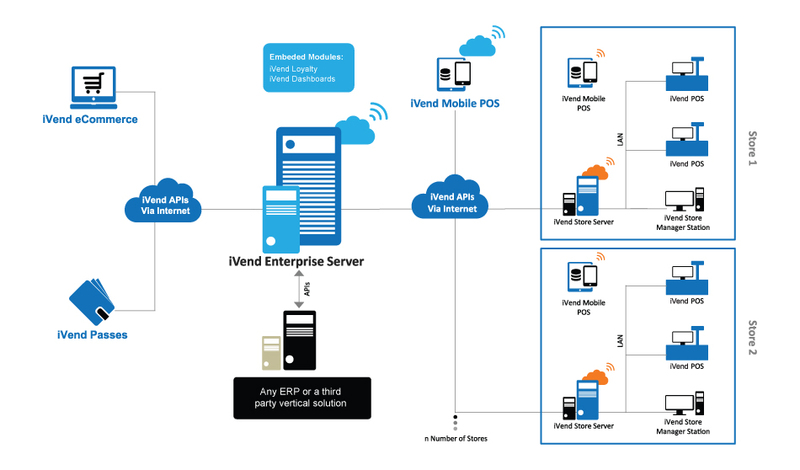 iVend POS connects to the iVend Enterprise at the store or at the Head Office over a LAN Connection with offline capabilities. iVend POS is highly flexible allows for multi-language support at the register and the ability to create Retail Profiles for each cashier, assigning specific roles and security policies to individual cashiers and not to the physical POS device allowing them to work on multiple registers seamlessly.